TIME Magazine has highlighted the site to be in the top-50 of all internet sites. Feeding Wall Street Journal, CNNMoney, Hulu, and even The White House, FORA.tv reach out far. At NEXT 2011 FORA wil be sending in their team to cover the event and feeding live casts to the rest of the world. 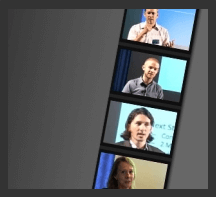 As a taste on what to expect, FORA now offers a handful of the best talks of NEXT 2010 – for free. Watch the founder of Flickr ect. Esther Dyson on health solutions of the future, marketing guerilla Will Sansom with a fountain of incredible examples or ”the man Obama ought to listen to” (quote TIME), Jamias Cascioog and his plans for saving the world.